Meanwhile, heat the oil in a large frying pan, add the fennel and fry for 3-4 minutes until softened. Add the salmon and cook for a further 2-3 minutes until lightly coloured. 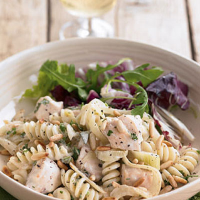 Serve with a glass of Chardonnay, a white wine that suits this dish well.